Kids have a certain need to feel comfortable. At all times. Hell, even as adults, we have our own needs to feel comfortable. I know I do. Having something that can make you feel reassured whenever possible is a must for many people. For many adults, that item is oftentimes their smartphone. But, that isn’t what I’m gonna talk about. 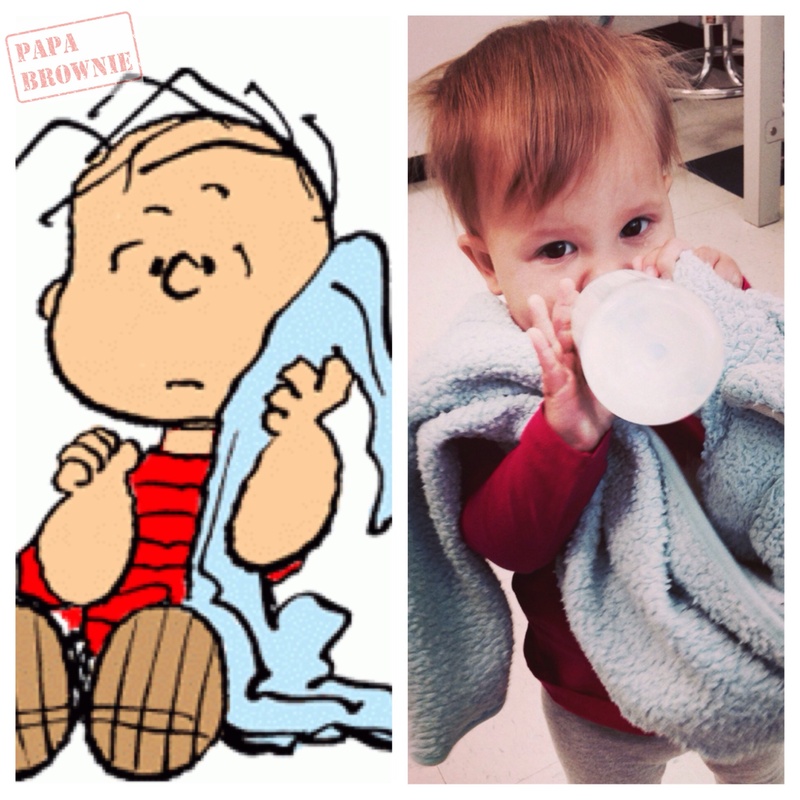 For lots of kids, through the ages, there is that one thing they just can’t let go of–the blankie. Sophia never really had something that she would always need to have with her. Unless you count the pacifier. If you do, then she had that–for a long time. But, Maddie is different. Siblings can be different, did you know that, guys? It’s true. Maddie has recently taken to toting one of two blankies around with her, as often as possible. One if blue and one is brown. Aside from color, they’re virtually identical. Each has an animal head pillow, which I guess makes it more comforting–since she just plops that bad boy down and lays down in the middle of the floor all.the.time. I’ll be honest, I love that she has found something that makes her happy, that makes her feel comfortable, that makes her feel a sense of security. Do I KNOW for a fact that’s how she feels? Of course not, she’s one, and can’t talk yet. But, I can sense it. She reminds me a lot of Linus from the Peanuts comic strips. Heck, she even looks like him half the time when she pulls the blue blankie around, as you can see in the picture above. I honestly don’t remember if I had something that made me feel secure when I was a kid. There are two stuffed animals that I have a vivid memory of from my childhood–one a penguin, which I named after the book Mr. Popper’s Penguins. The other was a tiny stuffed clown with shoe laces to tie, a zipper on its hat, and buttons on its vest. His name was Buddy Buttons. I still own him. Sophia would sleep with him for a while, until the zipper snapped off and a jagged edge was left on his hat. As for his name, my cousins renamed him “Pee Pee Clown” when I was young. Why? They said I tossed him in my kiddie pool and proceeded to pee on him. Did it actually happen? I hope not. But, they claim it did, even all these years later. Back to my main points. Knowing that your children have something they can hold tight–and hold dear–that makes them feel just a little more secure is a wonderful thing. Now, if Maddie is still clinging to that blankie when she hits her 20’s, well then that may be a different issue entirely! What about you and your kids? Did you or they have something that makes them feel more secure? Let me know in the comments, on Facebook, or Twitter.